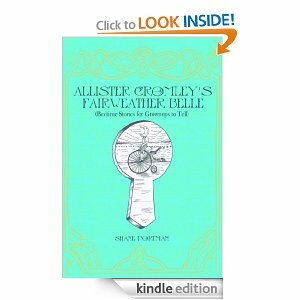 Today I am reviewing Allister Cromley’s Fairweather Belle by Shane Portman. Blurb: Allister Cromley’s Fairweather Belle is an illustrated collection of bedtime stories that were written to give grownups something to read aloud to other grownups or quiet to one’s own grownup self to invoke those childhood feelings of safety, wonder and even excitement in the face of all the questions that lay in the dark. Each sepia-tinted story was illustrated by a different artist and follows Allister, an introverted adventurer/philosopher/imaginator, on his journey through the early 20th century. He enlists in World War I, witnesses the awe and terror of the first escalator, becomes the most subtle of anarchists, dances with a bronze statue of Joan of Arc and even meets Winston Churchill (but not the Winston Churchill you may think). All the while, Allister is on a search to find the simple answers to the big questions and the complex answers to the small. My Review: How delightful bedtime stories for adults. These are definite flights of whimsy. They do have a moral behind them like most stories but some you really have to look for. Allister certainly does have an entertaining life. It is well written and edited and deserves 4 stars.